Good art can make any place look beautiful and wall murals are no exception. But what if you could use art to interact with people? Interactive wall murals are the perfect combination of art and engagement. How to create an interactive wall mural with ease? In this article, we will show you three different examples of interactive wall murals that you can create with ease. In 2017, Simran Sahni, an Indian artist, painted doodles to decorate the cafeteria wall in an office space in Noida, India. What’s unique about this wall mural is that it also contains a QR Code. “The idea started with doing something creative to bring co-workers together. The QR Code in the mural links to coupon codes and online games. The best part about using a QR Code in the design is that it doesn’t look forced. It just becomes a part of your design.” -Simran Sahni, QR Code Wall Mural Artist. The QR Code used in this mural is a Rich Text QR Code created using Scanova QR Code Generator. To scan a QR Code, you simply need a smartphone with a QR Code scanning app. In 2013, fourth graders from the Riverside Elementary School in Georgia, created the ‘Make a Difference’ wall mural. This wall mural was part of the school’s anti-bullying campaign. The mural was made using cardboard, paper towel tubes, paint, and other supplies. Once the mural was set up, students left notes of encouragement for other students in the paper rolls to help victims of bullying feel special and supported. “The students put special messages in the mural. We have to refill it every day. It’s popular, which is good. We had an anti-bullying initiative we talked about at the beginning of the year. 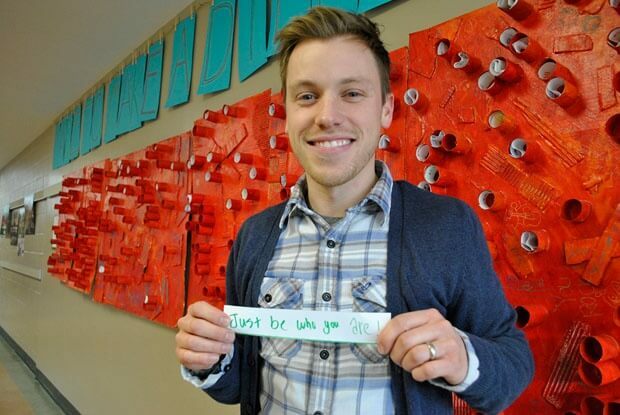 I did research and found out October is Anti-Bullying Month.” – Drew Jones, Art Teacher. Don’t let your leftover paper rolls and card boards go to waste. You can create a similar mural using all your leftover art supplies. 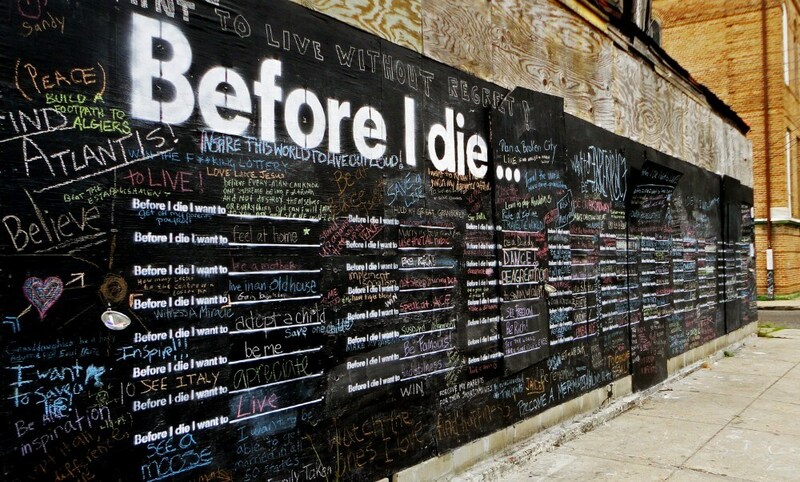 In 2012, Candy Chang, an artist from New Orleans installed the ‘Before I Die’ wall mural in a few neighborhoods in California. The wall mural was made of a giant black chalkboard stenciled with the heading-Before I Die. The mural encouraged people to fill in the blanks with their hopes, wishes or messages using chalk. “Many [residents] voice their excitement watching the chalkboard grow and evolve into something almost billboard style. A larger public message platform really.” Pacheco, Executive Director, Chicago Urban Art Society. You can install a similar wall mural by using a black chalkboard or painting a wall using chalkboard paint. Add games, quotes, to-do-lists to make your chalkboard wall more interactive. Also see how street artists are monetising their work. In Jul 2018, town leaders hosted a ribbon-cutting for Storm drain art murals. These murals focus on encouraging people to think about what goes into the water and help to keep it clean. Each mural will have a QR Code which, when scanned, will redirect to town’s website. It will help people learn actions to protect water quality. The town also wants to use the murals to encourage the schools to focus on water protection. Now that you know how to create an interactive wall mural, pick your favorite type and create your first interactive wall mural.